AngelLoader is a standalone FM loader where you can manage, install, and play all of your FMs in one place. Inspired by DarkLoader and NewDarkLoader, it supports Thief 1, Thief 2, and Thief: Deadly Shadows. It includes many modern features such as rating, game organization, tag management, easy .dml patching, an extensive set of filtering options, and a fast and accurate scanner for detecting FM titles, authors, game types, etc. 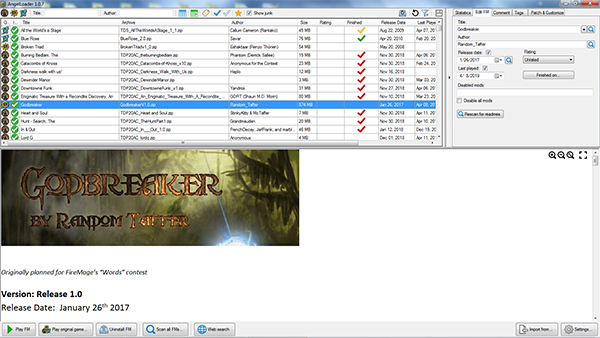 For taffers who are used to DarkLoader, fear not - AngelLoader detects game types accurately, every time. No more editing ini files for Thief Gold! Windows 7 SP1, Windows 8.1, or Windows 10 Anniversary Update or newer. AngelLoader is a portable app, so it must be extracted to a non-protected folder (so don't put it in Program Files or Program Files (x86)). Put it somewhere like C:\AngelLoader or C:\Games\AngelLoader, etc. Updates will not overwrite your user data (settings, FM data, etc). You can safely extract new versions to your AngelLoader folder, as only application files will be overwritten. Once you extract the zip file, you'll find a manual in the doc folder - AngelLoader documentation.html. Alternatively, you can view the manual online. -New shortcut keys: when FM list is selected, F5 refreshes and Shift-F5 refreshes from disk. -Basic support for un-converted FM installed dir names. -Removed troublesome timed-show of progressbox. Replaced with a more basic but reliable check. Thanks also to EnYB0La for providing the impetus to write what became FMScanner, AngelLoader's scanner module, which notably pushed me to figure out how to accurately detect game types for NewDark. Without that, I couldn't have made a standalone loader in any case. And a special thanks to Dahenjo for helping me hunt down bugs and suggesting a few good features. Well done! An FM loader that is both easy to use and quick has long been desired. Perhaps this will finally get those who are still using Darkloader to adopt a more modern and compatible solution. I have been closely following AngelLoader's development and compiling the GitHub commits periodically. It is fantastic to see the official release after so much progress. I plan on using this for all of my fan mission needs in the future, and I hope others look toward it as well. Woohoo! Finally something to replace my old DarkLoader with! Been looking forward to this one, Fen. Look here fellow taffers... it may be divinely inspired, it may be geekishly attractive, and it may be the closest thing to a perfect mission loader we’re going to get, but even so I’m very disappointed! You don’t even hear Fen’s voice guiding you while playing FMs, or going off on wild tangents so you miss half the loot. Nor would he implement any really valuable features like displaying social media feeds every 30 seconds or feeding your nagging cat. Instead, he stubbornly stuck to this ridiculous objective of developing the best FM loader in every way an experienced taffer could possibly imagine, which I gather wasn’t so easy under the hood, so he spent several months only doing that. What a waste of time! Yeah, it did get all my previous data so I could see it there right away and continue with missions I was in the middle of playing, and everything is laid out about as well as you could want and seems to work flawlessly, but I’ve about had it with these well-meaning new-fangled advances. After all this hassle I’ve decided to revert to Windows ME using DDFix and Thiefloader. Now where did I put that friggin 14.4k modem………. Awesome, can't wait to try FenLoader! Thank you for this, Fen! Can't wait to play out of the new loader. Makes me want to replay every FM so I can make comments/ratings, etc. Is this the final release or the beta version? It's the release version. Of course, if any bugs crop up, I'll update it. Cool, I'll check it out then. Just unzip into your AngelLoader folder and let it overwrite everything, but all your player content is retained in files that aren't overwritten. Actually, I have not installed AngelLoader yet. It will be a fresh install for me. You're going to hate me... But System Shock 2 support? So far, I'm liking it. I considered SS2 support early on, but decided to prioritize the games I'm most familiar with first, and put off thinking about SS2 till later. Then when nobody made a peep about it throughout the whole development, I figured, well, maybe nobody's really clamoring for it. I guess I was also hoping that would be the end of it, because SS2 doesn't really float my boat and I was hoping I could just forget about it and not have to research, implement, and support it. Still, I'll... I'll think about it. I also did notice an oddity but seems to have self corrected itself. I'm testing a new FM in beta right now. When I loaded the list of FM's it showed up as a Thief 1 mission. After clicking the show/hide T1 & T2 missions, it seems to have resolved itself. -Were you using game tabs or "one list with filters" (with the three game buttons)? -When the FM showed up as Thief 1, you mean it was in the list even though T1 FMs were supposed to be filtered out? Did it have the right game icon, or did it have no game icon? After you fiddled with the filters, did it have the right game icon then? -Your beta FM, did you put its archive in one of your normal archive folders? Was it installed at the time? Was this FM installed or listed with another loader and did you import data from that (or any other) loader? I have, so far, been thoroughly impressed with AngelLoader's utility. Especially on an SSD, the file operations are very quick. I would like to give some other feedback, however. On two separate machines running the latest version of Windows 10 and the listed prerequisites, RichTextBox does not seem to be displaying some embedded images, similar to how Wordpad acts when the user opts to not run potentially malicious code. This is evident, for example, in the readme for Lord Alan's Factory for Thief 2. Other special formatting, including GLML, is displayed correctly. Additionally, the option to load DMLs in the "Patch & Customize" section should probably not be available for Thief 3, since it cannot load dbmods. Okay, got both issues fixed. I'll wait for bob_doe_nz's reponse to see if I can fix his issue and then I'll release an updated version. Thanks for the feedback, it's very helpful! My, you certainly waste no time. After cloning and compiling, I can verify that both of my points have been addressed. I figured the RTF issue lied in the ReadOnly content, and it seems that it did indeed. Thank you for taking note of these! The Windows UI is a barrel of fun ain't it? There's more hacks than regular code! Ha, that is certainly true. I have heard of, and been in myself, quite the variety of Windows UI horror stories. I noticed you are are now using an older version of RichTextBox as well which makes some RTFs from older missions display properly. While this is very nice, it seems to have had an effect on the horizonal lines used to separate sections in GLML texts, which are now garbled near the right side. I seem to remember you saying something about them being stretched images, which is likely the reason for this change. Last edited by Jax64; 10th Apr 2019 at 18:35. Argh. I can't win with this stuff. If I use the latest version, then transparent images don't look right, they're displayed with a black background. But only on Windows 10. I implemented a hack to mostly fix the garbled right sides of lines. It should now only happen at unreasonably high zoom levels. That should work while I see if there's a better way. The need to support RTF files is a huge liability what with the Windows rtfbox being really the only choice, but it has to be done. If it were up to me, I'd just write my own RichText reader and displayer, but the spec is longer than most novels and I don't have much experience in full-on parsing or rendering. Jank hurts the pride, is all. So I'll see what I can do to really smooth this junk out. The hack works well for the time being. Unfortunately, you seem to be correct about the Windows RTFbox being the only realistically viable solution, since it is not especially good, but I imagine it is possible to remedy some of its more irritating shortfalls, albeit using disproportionally complicated methods. Unrelatedly, I also noticed it is impossible to follow links in a readme. Unlike the above, this shouldn't prove to be terribly difficult to fix.